Here are some foxes designs I made..
here are some close up before I pop them in the oven..
you need to preheat your oven to about 150c and then place the designs on a bit of tin foil (or as i had none some grease proof paper will do). Watching them shrink is such a magical thing, I wish I could have filmed it and done it justice. They will twist and turn in the heat whilst shrinking until done when they lay themselves flat. Some colours work a lot better than others and you need to learn to be patient and not touch them immediately or you should smudge the ink. Here are how these ones turned out along with a large (a full paged fox). Although clearly you cant tell from these images but you will be left a design that is made of thick hard plastic now. You can use these as badges or if you pre make the holes before shrinking they can be made into ornaments of pendants! Whilst I was at it I tried a few more designs.. I smudged this one as it came out the oven! It was so fun to do some 'just for fun' art again and not work to any deadline or for profit. I found it very therapeutic! (not that I don't enjoy my paid work but sometimes its nice to just do some experimenting!). Everyday this week Tom has come home to ''do you want to see the shrinkie dinks I made today??'' or ''hey! 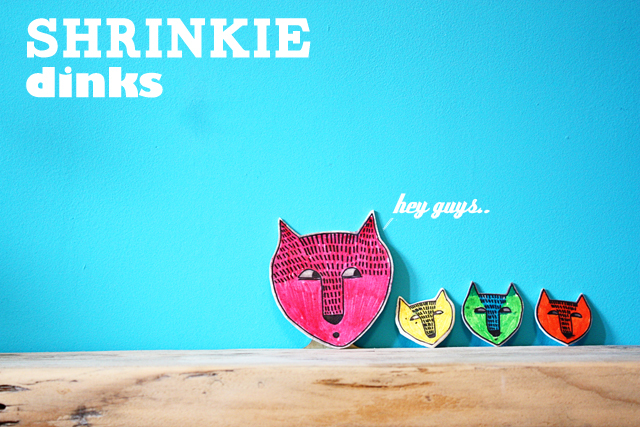 do you want to make some shrinkie dinks together this evening?'' (mostly I just like saying the word 'shrinkie dink, as that is funny in itself). He will be pleased to hear I've used up all six sheets..but look forward to ordering some more after Christmas! I love playing with shrink plastic - I used to sell jewellery made out of it for a few extra £ when at uni! Seeing all your shrinkle pics on instagram this week reminded me I've still got a stash of it somewhere. I'll have to dig it out! Love all your foxes! I bought some shrink plastic and tried to make some badges a while back but when I put them in the oven (following the instructions carefully) they came out all brown and burnt! Perhaps I just bought rubbish, which ebay seller did you use? aww the pictures are so cute!! really sweet! Wld love to c u drop by my blog!